From this day to the ending of the world we in it shall be remembered. We few we happy few we band of brothers. For he today that sheds his blood with me shall be my brother. 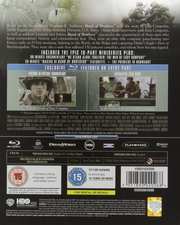 From Academy Award winners Tom Hanks and Steven Spielberg HBO presents the story of Easy Company - an elite team of U.S. paratroopers whose WWII exploits are as incredible as they are true. 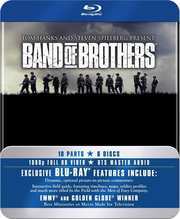 Based on the bestseller by Stephen E. Ambrose the epic 10-part miniseries Band Of Brothers tells the story of Easy Company 506th Regiment of the 101st Airborne Division U.S. Army. 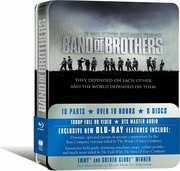 Drawn from interviews with survivors of Easy Company as well as soldiers' journals and letters Band Of Brothers chronicles the experiences of these men who knew extraordinary bravery and extraordinary fear. They were an elite rifle company parachuting into France early on D-Day morning fighting in the Battle of the Bulge and capturing Hitler's Eagle's Nest at Berchtesgaden. They were also a unit that suffered vast casualties and whose lives became legend. They were ordinary men swept up in the most extraordinary conflict in history. With the eyes of the world upon them they found their greatest source of strength in one another.